Carly drums in a band, and we had a mutual friend who asked me to go with her to see this band that’s the day I met Carly. It was a slow start for us but eventually we ended up together and we thought we couldn’t of been happier. We got engaged three years ago after being together for only about 1.5 years. I always wanted one of those chocolate advent calendars for the countdown to Christmas. It was December 1st and we were having dinner in (stir fry, my favourite) Carly handed me this advent calendar, I was beaming with excitement cause I’m a chocoholic. She told me to open the box labelled one and there it was a beautiful engagement ring and that’s when our life together really started. 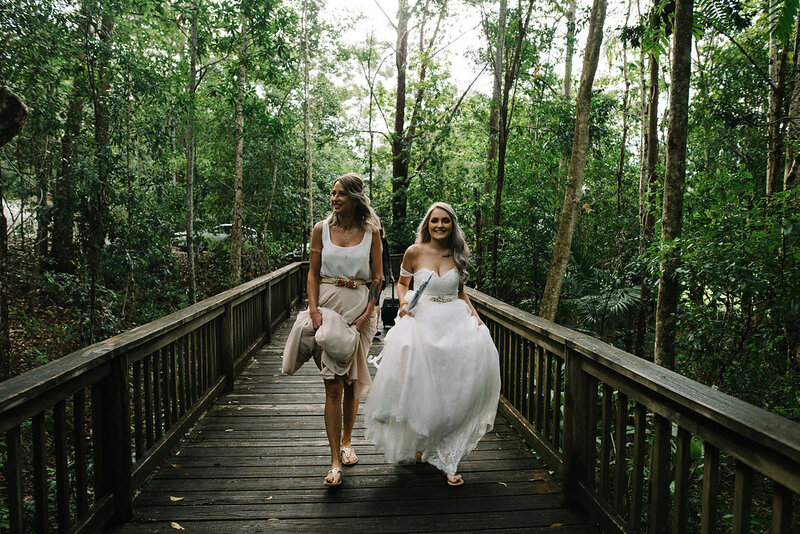 Our wedding planning experience was stressful and draining which is why in the end we decided to elope and surprise our guests at a party that they thought was a surprise birthday party for Carly. Surprise was on them. 8 weeks before our elopement I threw the idea out to Carly and she said yes and before we knew it the day had arrived. The most important thing to us was that the day was about us and our life together not about anyone else and that our fur baby could be there to celebrate with us. Our wedding dress search was rushed with 8 weeks to find something. Luckily I had been into see Nancy at her boutique prior to the elopement (as we were originally planning a larger wedding) after we decided to elope we went in to see her and she said she could make our dresses from scratch in time for the elopement. We had no idea what “the one” was. We both went in with pictures of this and that and joined bits and pieces together, luckily for us Nancy knew exactly where our imaginations were going and created us both our dream dresses. My (Amanda) dad passed away 8 years ago and we had a special button hole made for him that matches our hair pieces and it went out to his plaque the morning of our day so that he could be “wearing” it while he was with us. Archie our fur baby came with us to our ceremony and photos as well. Only do what makes you and your partner happy. You can’t please everyone. So take a deep breath and enjoy your day it goes crazy fast.